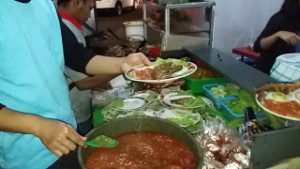 For some people, going to taste the culinary delights of the street food in Bandung is just a hobby that’ll increase their experience of having enjoyable time there. 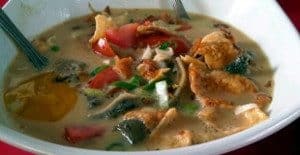 As Bandung is full of outsider coming there to study or experiencing the lovely city so the local delicacies will has varied option to cater to their different stomach. Below will be listed some of the best food among them. 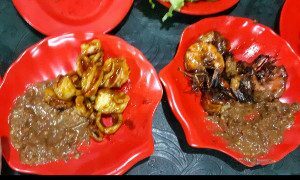 From its name, then it is predictable that this food is sold in Pasar Gempol located on Jln Gempol Kulon no. 53, Bandung. Its location is between Jalan Dago and Banda Road. Kupat Tahu Gempol, which has been selling since 1975, also opened three other branches, namely in Setiabudhi, Dago, and Gasibu. You can find this food sold behind the simple tent stall on Banceuy Street. They sell the leg meat soup that was famous for its deliciousness. They also provide various menu options such as stuffing soup, legs meat, and all other meat from goats. If you pass through Jalan Sudirman near Pasar Andir area, then you can stop to taste Pak Otong chicken porridge. Pak Otong is the second generation of his father, Mr. Handun, selling chicken porridge since 1947. 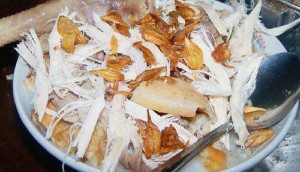 The taste of the delicious porridge with large chicken make this porridge to never be deserted with visitors although sometimes occasional smell from the wet market nearby might pass by. This Chicken porridge is served without crackers and is sold every day from 18:00 until 01:00 in the morning. Located at Jalan Astana Anyar 264, Bandung, AA steak sells at 17.30 until midnight or until the menu runs out. There are a variety of menus such as Bistik Rice, Cah Mushroom Rice, Puyunghai Rice, Rice Capcay, Rice Kuluyuk, Fried Noodle, Soup Noodle, Fried Kwetiaw, and Fried Rice. 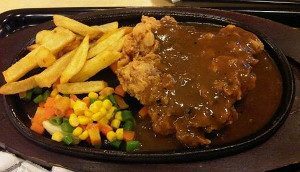 But the flagship menu, of course, is Bistik Fried Rice, which is fried rice that’s given crispy fried chicken, combined with potatoes fries, carrots, and beans. 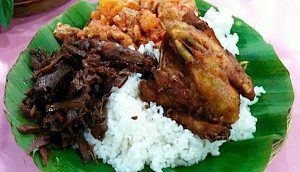 For the lovers of gudeg Jogya, which is gudeg with the characteristic dominant of sweet taste, Gudeg Bu Ratna could be one interesting choice. This Gudeg is made from young sweet jackfruit and eaten with a tasty and slightly spicy kekecek, tofu bacem, eggs, and chicken meat combined with tasty opor gravy. This Gudeg business is owned by Ratnasari Anggoman started since 1992 and now has 14 branches. One of them is located in a simple tent at Pasirkaliki and Semar road. The delicacy of the menu is not to be doubted. In the tent stalls located on Jalan Rajiman (opposite Tomodachi café), the menu available included: ati ampela, sate intestine, pecel catfish, rice uduk, and of course the favorite is grilled honey chicken. The portion of rice is large and satisfying, with added cabbage fried that’s also crispy. Sweet tasty chicken that combined with the sweetness of soy sauce certainly makes you fall in love with this delicacy. Batagor is an abbreviation of Baso Tahu GORENG (fried tofu meatballs), this one food is really a typical cuisine of Bandung. Batagor Hanjuang is sold in a cart just in front of Rumah Makan Anugrah, at Jalan Astina (behind Istana Plaza). The Batagor is not too oily, and the fish tenggiri is quite tasty and its spice beans are also delicious. 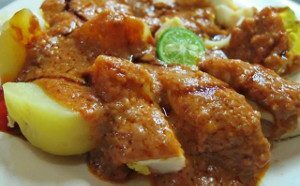 For the typical culinary food, then Batagor Hanjuang is really recommended. At Jalan Jenderal Sudirman, not far from Andir Market, you will find an alley named Gang Luna. In that alley, you will find Delicious Noodle which is sold in a cart. 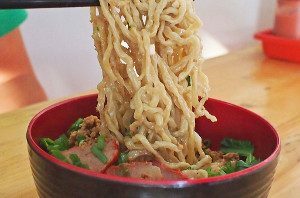 As the name implies, Delicious Noodle is also known as Gang Luna’s Noodle and it tastes very delicious. Delicious Noodle Gang Luna has been sold since more than 20 years ago and to this day Delicious Noodle Gang Luna is still a favorite culinary in Bandung. 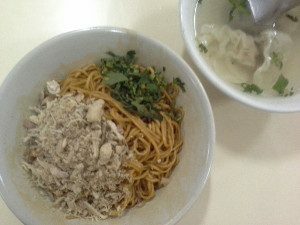 Feel the delights of a bowl of yamien noodles (salty or sweet) with a bowl of meatball sauce and dumplings. The thin noodles tasted chewy and crunchy and the sauce was not too greasy. Every meatball lover must try Malang Meatball Cipaganti. This business was started by H. Muhammad Syahroni in Malang in 1978 and continued by his son, Rony Yulianto. Initially, meatball Cipaganti is sold around the neighborhood in a cart. After two years of selling around then the owner opened two stalls at the intersection of Pasteur and Jalan Cipaganti (next to Cipaganti Raya Mosque), and until now more and more stores are being used as a shop. The secret of the soft and delicious meatball is because the owner uses more meat than flour. The meatball is also healthy because it does not use chemicals in its mixing. For sate fans, you can try Sate Anggrek. Named Sate Anggrek because of its location located at Jalan Anggrek, intersecting with Jl Riau. It will be easy to find because the smoke from the burning satay usually looks steaming up from the road. Some of the available menus is chicken satay, beef satay, goat satay, and there are also eggs satay. The satay is delicious with a large enough and tender meat. For those who like soto sulung, then you may try the one that’s sold in a tent shop on Jalan Cilaki. Delicious soup with meat and offal with a yellow mixture of thick sauce and savory. You can even also added extra boiled eggs. For lotek lovers, do not forget to try Lotek Kalipah Apo 42, located on Jalan Kalipah Apo 42. Enjoy the delicious pile of vegetables consisting of cabbage, bean sprouts, long beans, spinach, kale, young jackfruit, tempe and lontong. Do not also miss the shrimp crackers that’s so delicious. 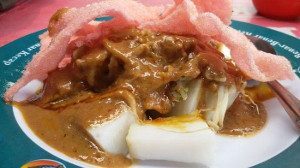 In addition to selling lotek, Lotek Kalipah Apo which has been operating since 1953 is also selling gado-gado, pickled vegetables, pickled fruit and rujak fruit. This Martabak located in Pasar Andir area at Jalan Jenderal Sudirman No. 413 also sells thin Martabak with the contents of grated parmesan. When making Martabak then the butter is used only in sufficient quantities so that the Martabak is not too oily. The topping also varies and one of the recommended menus is Martabak corn. The culinary taste of the street food in Bandung is one of things that make visiting Bandung will be a great experience. As Bandung is design to be a tourism city that will make many people come there to have a good time. The economy of Bandung is dependent on home industry so many creative delicacy will always be produced by Bandung people to satisfy those who come there.